The fresco “Fire in Borgo” tells about the events taking place in one of the central districts of Rome. According to legend, a fire broke out near the palace of the Pope, which subsided only after the appearance of Pope Leo IV himself. Appearing on the balcony, the Pope stopped the fire with the sign of the cross, aimed at the crowd and the flame that framed the whole quarter of Rome. 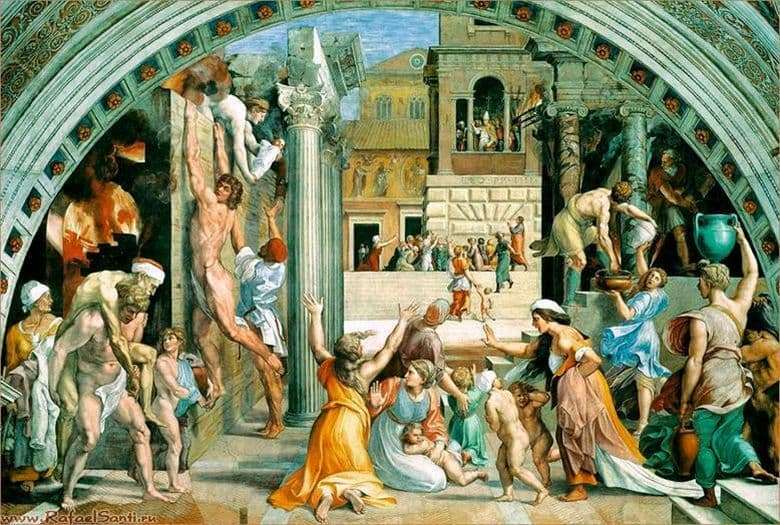 The canvas conveys the panic and horror of the inhabitants of Rome, suffering from indomitable tongues of flame. In the upper left corner one can see a woman from the balcony transmitting her baby to a man in order to save the child from the elements. Flaming, she is ready to sacrifice herself in the name of saving her child. Below is a part of the terrain, embraced with bright red flames and black smoke. The overall light color palette of the work is emphasized by the darkest part of the composition, which conveys the carrying of death and the indomitable nature of the elements, the trouble that suddenly overtook the peaceful city. To the right is an expressive group of people with jugs of water who make every effort to save themselves. In the central and farthest parts of the picture one can see the building, on the balcony of which Pope Leo IV stands, directing the sign of the cross to the immense flame. Waiting for a miracle and salvation from the Holy One, a group of women with children gathering their hands to their ruler gathered under the balcony. They praise the Pope and beg him to save Rome from the fire. The canvas depicts a beautiful young man – Aeneas, carrying on his shoulders a exhausted old man from a burning quarter. Next to him is his wife Kreuz and son Ascanius. The appearance of Aeneas on the canvas indicates that the main plot of the panel originates from the work of Virgil “Troy”, which also describes the fire.